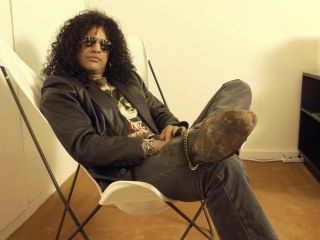 Summing up the appeal of his upcoming Epiphone Slash Appetite For Destruction Les Paul, Slash tells MusicRadar, "The guitar that I used for Appetite, the Use Your Illusion records, Snakepit and my new record, it's a replica of that guitar. The sound on Appetite is a very sought-after tone - I've been hearing that for years and years - so this Epiphone Les Paul is for the die-hard fans who really love that sound." Having already released two Gibson Appetite Les Pauls, Slash, that most famous of top-hatted shredders, has teamed up with Epiphone for a limited edition (as in only 3000 will be manufactured, and then that's all, folks!) AFD model that will hit stores come October. "It was always my goal when doing a Slash Les Paul to do the Custom Shop, the USA model and the Epiphone version, as well," says Slash. "The Epiphone is more affordable, but it's still an amazing, great-quality guitar. Appraising the model, the guitarist enthuses, "I tell you, when you look at the specs between the guitars, they're almost identical: the woods, the hardware, the components. The biggest difference is the headstock - the others say 'Gibson' and this says 'Epiphone' - so they're a steal!!!" And with that, he lets out a hearty laugh. Getting down to specifics, Slash says, "All things considered, they have the LockTone Tune-o-matic bridge, which is different; the machine heads are different. But most of what's on the guitar - the pickups, the capacitors, all of that - is identical to a model that costs twice as much." And make no mistake, price was a prime concern for Slash when designing the Epiphone AFD Les Paul. "I know what it's like - it look me years to save up enough money to afford a regular Les Paul," he says. Slash played a prototype of the Epiphone model on tour recently in Europe, plugging it into his live rig right alongside his Gibson Custom Shop and USA models. "And there was no difference in the sound," he marvels. "Nobody could tell I was playing a different guitar. It sounded incredible." Each Limited Edition Slash 'Appetite' package will come with a hardshell case featuring Slash's artwork, a certificate of authenticity personally hand signed by the guitarist himself and 12 custom Slash guitar picks. "You don't get picks with the other models," he says, chuckling. For more information, visit the official Epiphone website.